The euphoria from scoring against the best team and the best defense in the Premier League lasted all of 3 minutes. That’s because Arsenal decidedly does not have the best defense in the league; they don’t even have a good one. 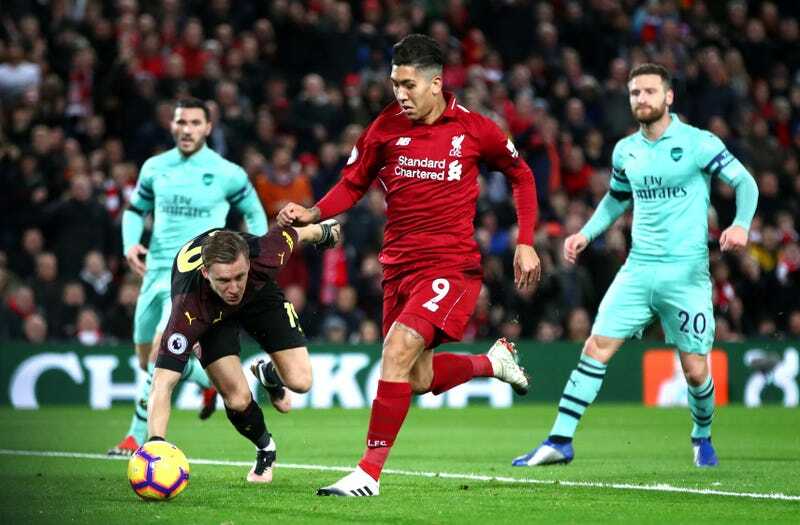 And so, when Roberto Firmino came calling, there was very little the Gunners defense could do to stop him. Count them: a sloppy giveaway, two missed tackles, and a desperation flop by Lucas Torreira. Just like that, Liverpool went ahead. If the game were to have ended 2-1, maybe Arsenal takes solace in the fact that only a couple of defensive lapses cost them three points. Unfortunately, it did not end there. But the fourth and fifth goals for the Pool Boys were defensive catastrophes. First, beleaguered center back Sokratis kicked Salah three different times in the box, conceding a penalty that effectively ended Arsenal’s hopes of stealing back a point. That’s probably not as bad as the build-up to the final Liverpool goal, though, as left back Sead Kolašinac inexplicably pushed Liverpool defender Dejan Lovren in the back just inside the box, giving Firmino the opportunity to collect his hat trick from the penalty spot. In all, Liverpool had 15 shots (10 on target), and the Reds generally treated Arsenal’s backline like they were a League One side. Jurgen Klopp lined his side up with 4 attackers—Salah, Firmino, Sadio Mane, and the Powercube Xherdan Shaqiri—and let them run repeatedly at Arsenal’s overmatched defense, which received little cover from the midfield. Considering that Arsenal had been finding success packing the center of the park in recent games, it’s stunning that coach Unai Emery lined up with just two center backs and two center midfielders, including human molasses Granit Xhaka. Liverpool keyed in on that early, with the first two goals going straight down the middle of the park. It’s hard to blame Emery, though; he’s generally gotten his team playing well all year and Liverpool are quite a side to behold, particularly at home. More concerning is the fact that Arsenal hasn’t bought a quality center back since...Laurent Koscielny in 2010? Sokratis and Shkodran Mustafi are (probably) decent squad options, but having those two featured in your best center back pairing is not sustainable for entire Premier League season, particularly when you have Champions League aspirations, as Arsenal does. While midfield starlet and summer purchase Torreira can already be considered a successful purchase, Arsenal’s refusal—or inability—to strengthen the backline with good players was always going to give them problems, particularly away from home against a quick attacking side like Liverpool. This beatdown wasn’t particularly insightful for the league leaders; they just did what they do and capitalized on every mistake with their speed, ball movement, and precision. There wasn’t much difference between this 5-1 smackdown and their 4-0 defeat of Newcastle mid-week. However, what it does tell us is that, for all of Arsenal’s progress this season, it’s still the same old Arsenal at the back. With the January window opening up in a couple of days, it’ll be up to Emery to try to bring in some help. Otherwise, another season will pass the Gunners by with no trophies and no Champions League to show for it.